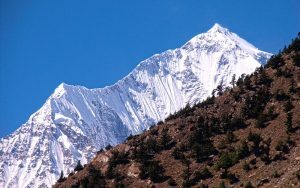 Dahulaghiri to Kanchenjunga. - BOUNDLESS HIMALAYAS TREKKING & EXPEDITION (P.) LTD.
To the Boundless Himalayas Treks:We like to express our deepest gratitude to you all, Boundless Himalayas Treks and Expedition (P.) LTD. AS we arrived in Nepal we had only rough ideas what a kind of trekking we are looking for. We wanted to go off the beaten roads as Everest and Annapurna (too crowdy) to we decide with your help for a trekking in Okhaldunda/Solu district, a more remote area. The result was extraordinary. Under the leading of Sonam Phincu, (an excellent guide) we had our best trekking in Nepal. Sonam knows the areas very well and we had at any time close contact to the local people. And till the time we cross the old Everest trek route by Jubesi, we meet NO other tourist(!). Additional we had views of ALL the 8,000m mountains of Nepal from Dahulaghiri to Kanchenjunga. Here was not possible. And last but not least, you organize for a very good price/service relation. Again many thanks to you and your company staff and guide from the whole two people group.